I’ve been doctoring cheap fake Christmas garland ever since I was a kid. My mom is not really into decorating but my older sister was getting married and having her reception at our house a week before Christmas. So my mom finally sprung for a bunch of Christmas decorations and I was over the moon, trying to make the house feel extra beautiful, twinkly, and Christmasy. And that meant a lot of fake garland. Like Hallmark Christmas movie-a-lot. 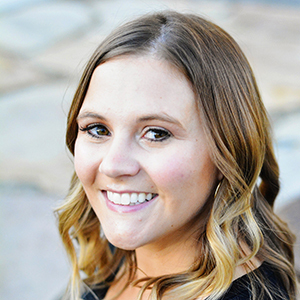 Fast forward *cough cough* years and now I have my own house and the little girl in me still LOVES garland but the grown up me wants to graduate a little. 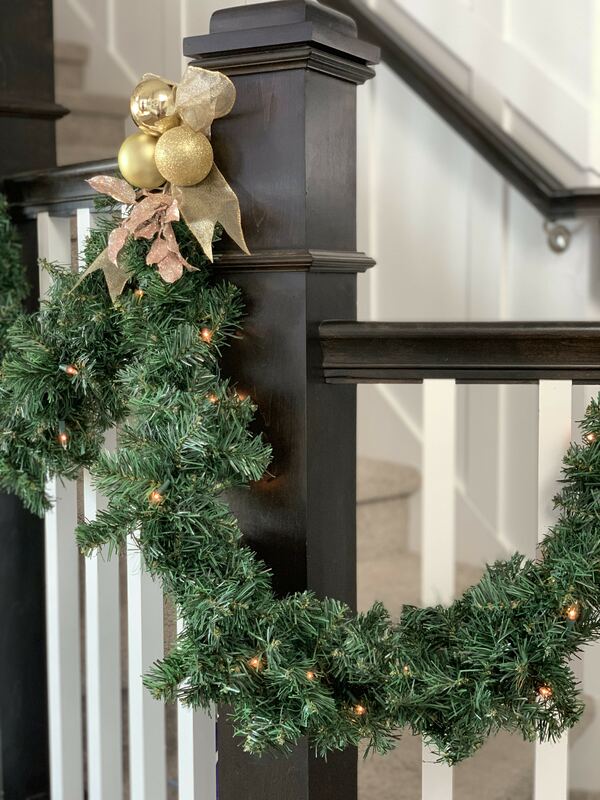 The first year in my new house I bought a bunch of the cheap fake garland and doubled it up so it was a lot more beefy than the skinny single strand. I also wrapped them with white lights. However at the end of the day, it just still looked just so fake. The next year I did a 180 and did all real garland. But even though I found it for a good price at Costco, it was SUCH. A. MESS. I couldn’t deal with it. It dried out pretty quickly and started shedding everywhere and then when we took it down, wow! I guess you’re supposed to spritz it and pre-soak it but seriously, as a mom of 5 kids, I can’t. I just can’t. The next year I skipped garland altogether. 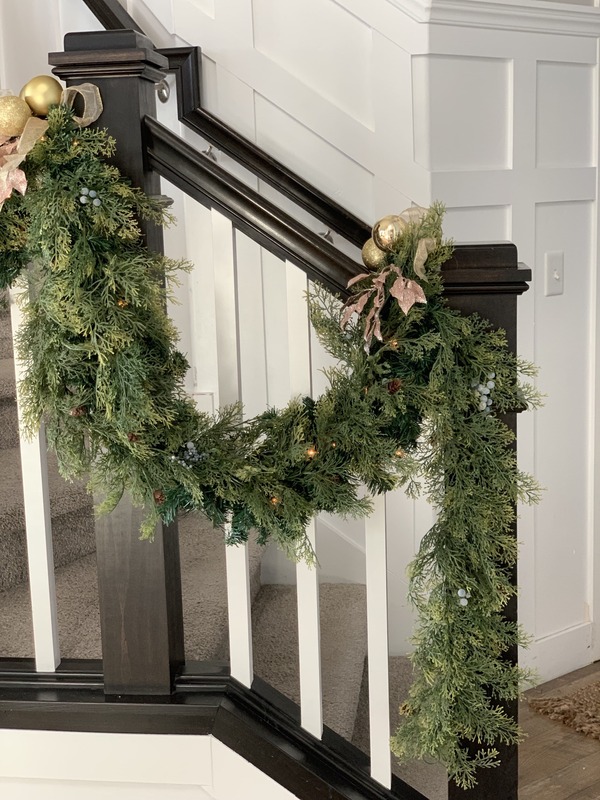 I just wanted to do artificial garland that was really pretty and realistic but everything I really liked cost like $60 for ONE. Um, no. Not when I needed like 10. 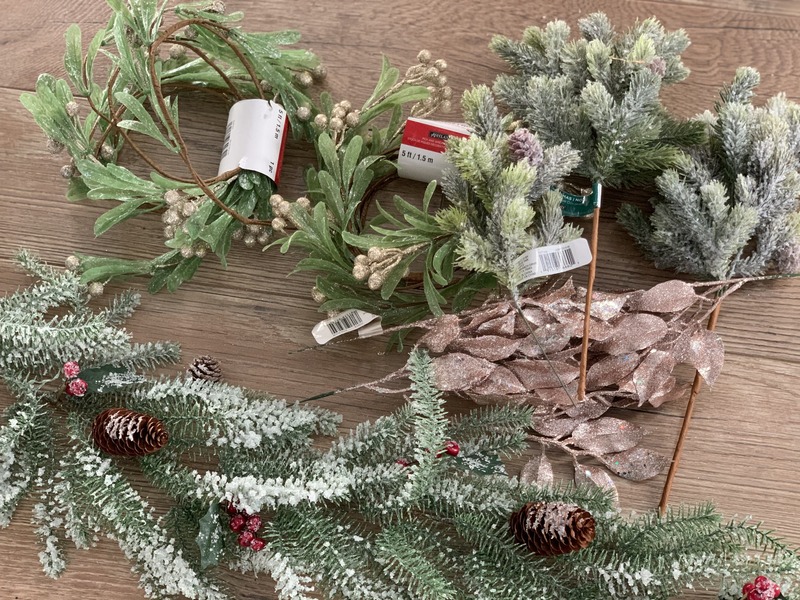 This year, I was browsing the garland at Michael’s and I found a really pretty fake pine and berry garland AND it was 60% off ($12 each!) I had to go to two different stores to get enough but I bought it all because I’ve wanted it for so long! I got out my fake garland from the first year and put it up. 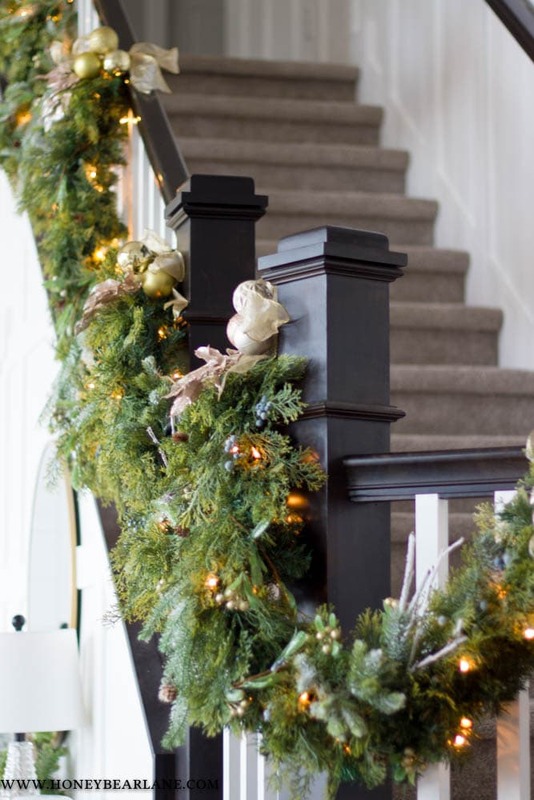 I swag it down the side and tie it to the banister with gold ribbon. I’ve used zip ties but they scratched the finish on the banister. 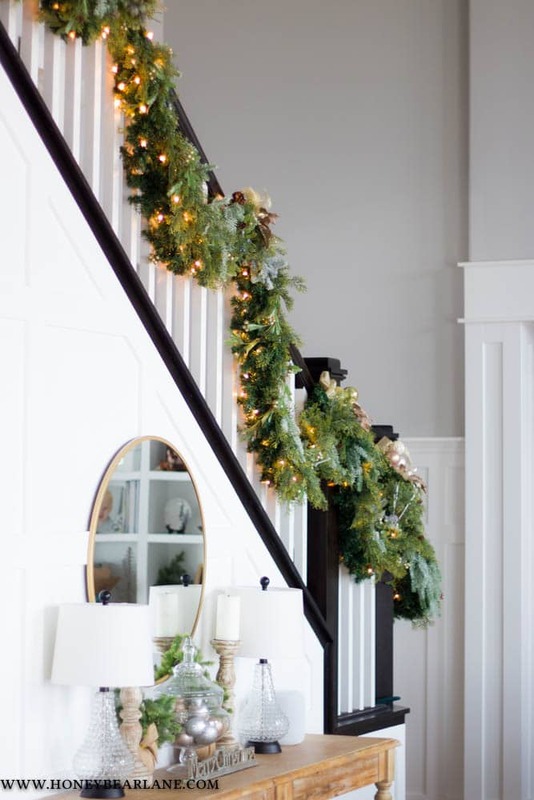 This garland is two of the cheap fake strands twisted together with white twinkle lights wrapped around it. 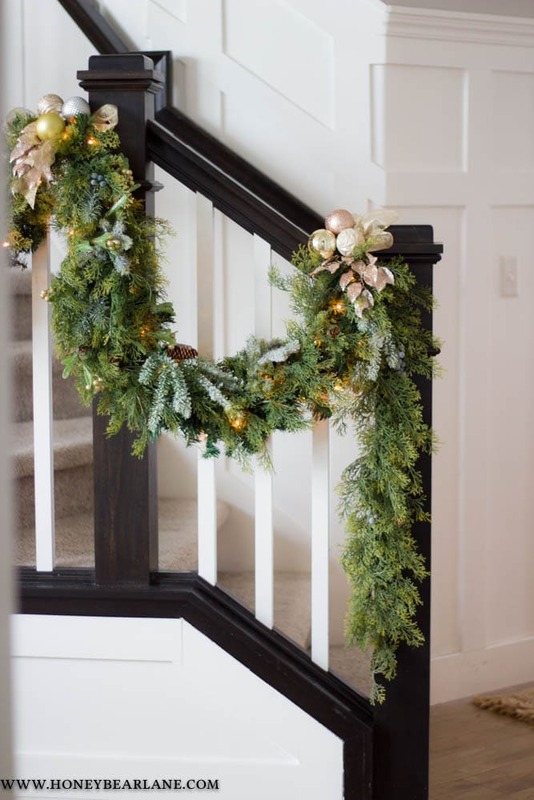 The next step was to incorporate the new garland. I think it will stay nicer if I don’t store it with the cheaper one so I didn’t wrap them together. 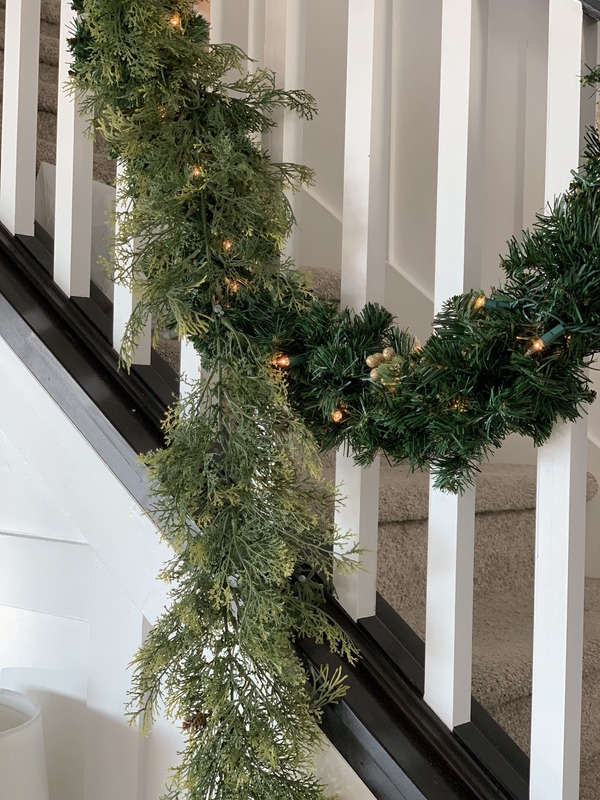 I used the wire in the cheap one to twist around some of the boughs and basically the entire garland just sits in front of the cheap one, but with the cheap one providing the bulk behind it, it looks much more full and expensive. I tried to drape it as naturally as I could. You could stop there but I was having fun seeing how pretty I could make it. I wired three ornaments together and added them to the top of each swag as well as adding a pick of rose gold leaves. 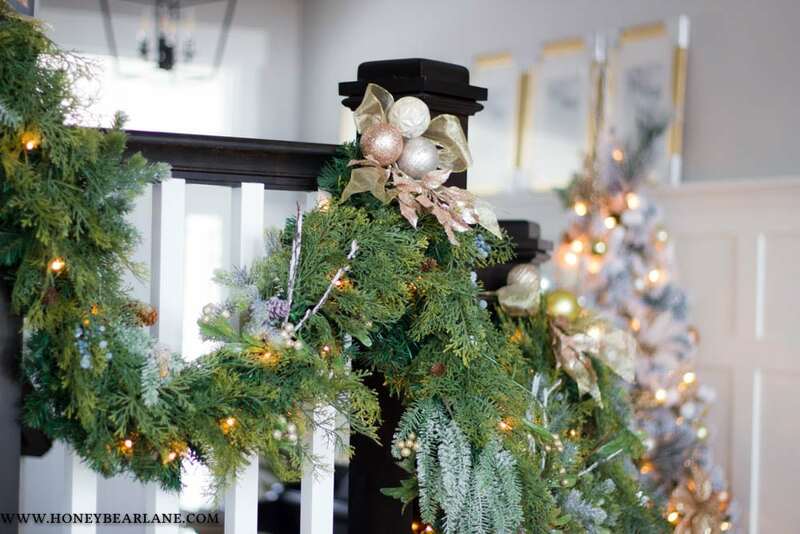 Then I wrapped a simple gold berry garland around and added some frosted greenery as well. A lot of people add in fresh greenery from the yard, which you could totally do (and that would be free) but like I said, I didn’t want to deal with the mess. Maybe it’s lame, but I think artificial plants have come such a long way since the cheap bubble gum pink roses, and I’m totally okay with fake! Especially with Christmas stuff. 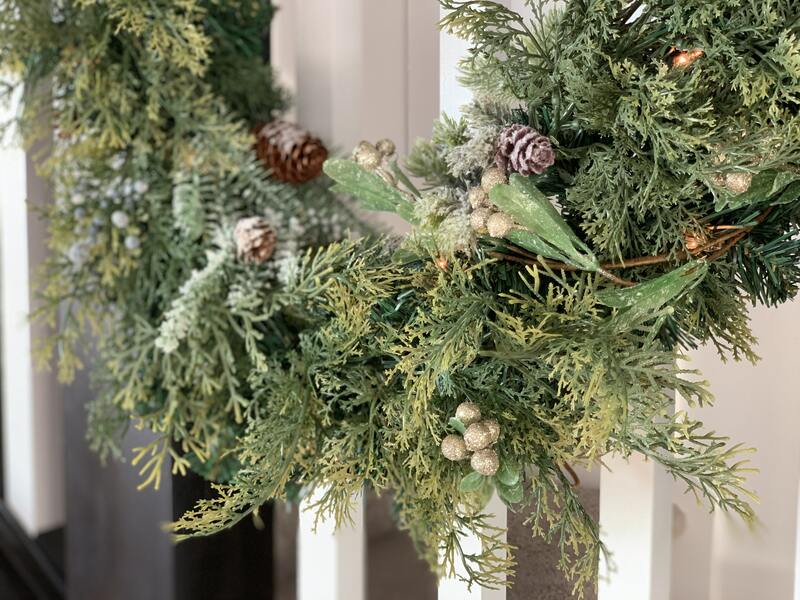 Basically the key to realistic looking garland is layer, layer, layer! It’s the same with floral design. You start with a base greenery and then keep adding the more beautiful things on top and it will end up looking full and visually interesting. 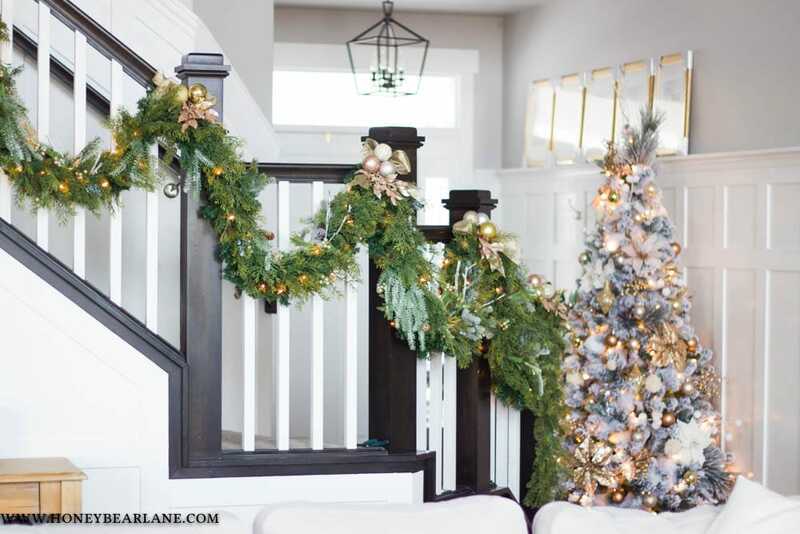 The last step was to add some pretty ribbon bows and clustered ornaments at each spot that joined with the banister. It does take some effort but I really think it’s worth it because it is just so gorgeous and adds so much to my Christmas decor. Fake Christmas garland FTW! Looks great Heidi, I can’t believe tomorrow is Dec.1st.